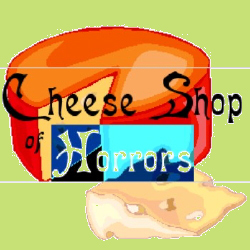 "Cheese Shop of Horrors" appeared on Green Beings' 2007 "Where Do You Get Your Protein" single. An earlier version was the zongoftheweek.com feature for Halloween 2004. For horrifying chills, we take a look at the evil that lies lurking behind the unassuming facade of one neighborhood cheese shop. What we find there is a cross between Alice Cooper, Monty Python, and Broadway's "Little Shop of Horrors." Have you got any cheddar? Have you got any brie? Have you got any blue cheese? Have you got any goat cheese? Have you got any munster? Have you got any jarlsberg?